Machine and plant designs that live up to the German “Industrie 4.0” framework and the similar concept of the “Industrial Internet of Things” require smart drive technology with high flexibility and functionality. The drives must be seamlessly integrated into communication networks, ensure efficient data processing, and support modular, decentralized control concepts. Launching the label “NORD 4.0 READY”, German manufacturer NORD DRIVESYSTEMS provides scalable electrical drive systems and software to cover the full spectrum of tasks, from simple actuators to complex networked systems. Low-maintenance, versatile distributed drive controllers ranging up to 22 kW are available for synchronous and induction motors, covering a large percentage of industrial applications. Featuring powerful processors plus an onboard PLC, the frequency inverters can handle complex control processes, autonomously respond to process conditions and even resolve malfunctions. 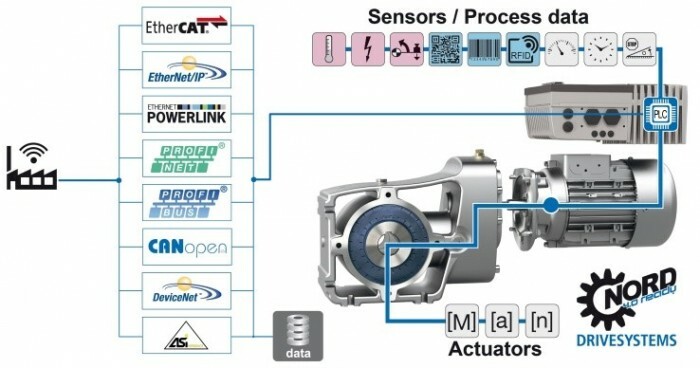 The inverter PLC processes data from connected sensors and actuators and supplies high-quality drive and application-related data to the control room and other network nodes. Drive units can form groups for certain tasks, for instance to synchronize speed or positions. Pre-defined parameter sets for hundreds of commonly required functions including the PLCopen motion control modules facilitate application development. As a full-scale drive systems provider, NORD manufactures inverters as well as motors and gear units. Around the world, the manufacturer offers to supply drive systems for entire plants assembled and parameterized ready for use, with standardized plug-in cable connections (1 x power, 1 x data) for time-saving commissioning.